The second location of the Loop barbecue spot, Blackwood is not the best ‘cue in the city, but it’s good and it’s a welcome change from the usual lineup of fast food and salad/wrap restaurants. Blackwood brings in spices from the Spice House to use in its sauces and rubs, and the meats are smoked for hours on site. Blackwood’s menu is very simple—choose brisket, pulled pork or pulled chicken and get it on a platter, in a sandwich or on a salad. Then you pick your sauce and side dish. The menu is even more simple, because here is exactly what you’re going to get—pulled pork with mustard sauce, a side of warm cornbread and the lemonade that’s made in house. 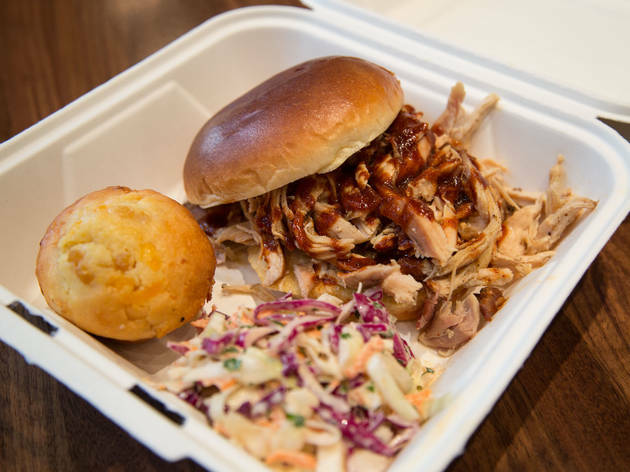 The pulled pork is tender and flavorful and the mustard sauce is tangy and an exact replica of the sauces you find in South Carolina. Be prepared to wait though—this place gets busy during the lunch rush. Bus: 60, 124, 125, 157. I didn't think there was such a thing as BBQ fast food but Blackwood does it well. I wouldn't put this up against any of the sit down BBQ spots in Chicago. 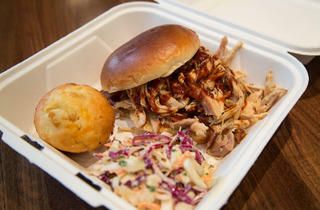 Though, it's quite good if you have a taste for smoky BBQ and want it quick. I enjoyed all the meat options, smokehouse beans and anywhere that has Eloté is a friend of mine. Great for lunch but not a sit down dinner BBQ joint.